Brilliant, to say the least. My first thought: “I wish I had that in college.” And my second thought: “This will be great to use with my students.” And then I realized, looking it over, that I hate grammar, and more importantly, the arbitrary rules of punctuation used to explain grammar. And even more importantly, I don’t teach anymore. But I digress. Also brilliant. I love Weird Al’s witty disdain for society’s failures (and if you don’t, you’re just lying to yourself). Then I moved to Idaho (which is a whole other story). Anyway. If I put this off any longer, what I have to say will already have been said. Hopefully it makes sense written down, because it does in my head. So. What is the point of grammar, anyway? I mean, really the point. Or for that matter, textual communication in general? From all that I’ve learned so far in my short life, text is the means by which we represent speech. For thousands of years humans spoke without written language: developed grammars and complete languages, with none of it written. Then, someone thought it would be a good idea to start carving shapes into rocks and clay, on wood, and then eventually paper. All of which led to where we are now with typewriters, computers, cellphones, etc. Grammar, of course, is not a byproduct of textual language; but text does present the ability to more meticulously dissect, analyze, and debate it. For hundreds of years, at least in English, we’ve had roughly the same grammar, thanks to the unification that text-type creates. The last hundred years have really solidified what we now teach in schools as technology has attempted to control textual language (i.e. Microsoft Word). However, through this exacting of textual language, we’ve lost the original (and I believe more important) purpose of punctuation, grammar, and language: to represent the spoken idiom. Text serves no other purpose than to represent our verbal communication. It has never been a means by which to replace it. To control how we speak. Only an endeavor to capture the intricacies of human sound. But we don’t speak with punctuation. Now, I can only attest for myself, but I do not think about commas and semi-colons and periods when I’m speaking with my friends or family or whomever. Nothing of the sort. As a child, I loathed Language Arts. The title itself made no sense to me. How is punctuation and sentence structure diagramming art? Or language? Or anything that an elementary school students would care about or want to practice? Point being, I never understood or learned proper grammar and punctuation usage until Graduate School. In the U.S. we are taught that punctuation serves one purpose: the grammatically correct organization of written language, as deemed acceptable by dead white men through thousands of years of trial and error and debating. It was not something to be read, but only a way to separate ideas on the page. Grammar, to me, is something to loathe, because it makes no sense. There are rules. Lots of rules. Rules that even the best grammarians really don’t understand. Independent and dependent clauses, conjunctive phrases. I would list more, but I don’t know any, because I don’t care. Punctuation made grammar possible, as I saw as a child. But even after taking a History of the English Language class (one of the coolest classes I ever took, and one that I think all English speakers need to take in order to understand the language we speak and write), I still don’t understand why we perpetuate most of the grammar rules we use today. As a creative writer, however, punctuation is very different. The rules aren’t as concrete, or adhered to at all sometimes for that matter. Punctuation, to the creative writer, is about breath. It’s about rhythm. Joseph Campbell said this about mythology: “Mythology is the song. It is the song of the imagination, inspired by the energies of the body.” As writers, we are constructors and participators in this Mythological song. We are the musicians of imagination. We create voices and scenes and experiences in the minds of others. That’s our goal. We manipulate little black symbols representing phonetics representing meaning into stories that have the power to alter an individual’s perception of their own reality, and the world, and universe in general. But, in order to facilitate that interaction between writer and reader, these symbols need some sort of organization, agreed upon by those who use them. Which brings us back to grammar and punctuation. And the unfortunate need for it to make meaning possible. Sounds contradictory to what I’ve already written, but such is life. I’ve thought a lot about this, especially in the last year while trying to teach English Composition college students how to write. Then, the epiphany. Like a bolt of lightning struck my brain. Text is nearly the same as musical notation. The notated song of speech. I came up with a musical analogy for punctuation, and although it’s how I explain creative writing, I think this rule really applies to all written language (not only in English, but then again, I know next to nothing about other languages). I believe punctuation can be understood through musical notation. Just as each note/rest represents a specific beat/pause length within a measure of a song, so does each syllable/punctuation mark represent a specific beat/pause length within a sentence. I only want to focus on punctuation, because syllabic rhythm and beat timing in words is something else entirely. There are more rest types, but they are shorter pauses more suited to speaking rather than punctuation. So. How does this all relate to punctuation? 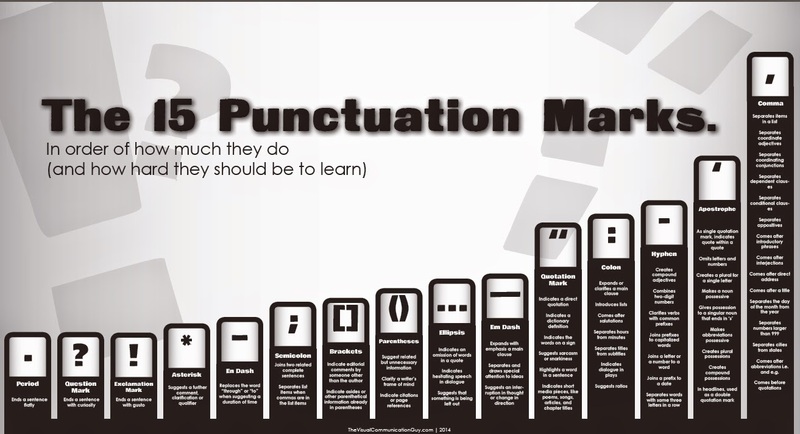 As I mentioned, we are taught in the U.S. that punctuation serves very specific grammatical purposes that must be memorized without intuition to help guide exact choices. And don’t forget the exception to every single rule that you learn; multiple exceptions, in fact. This is what happens when there is a disconnect between the arts and sciences (just trust me on that). In order for this music analogy to work, you have to unlearn what you know about punctuation. Forget independent and dependent clauses, adverbial and prepositional phrases, etcetera. Just take a moment to unload that information, it’s okay, you’ve got time. This isn’t going anywhere. Okay. Mind clear? Good, because I’m not going to explain what each punctuation mark is taught to be, I am only explaining how I see punctuation, and how I believe it should be used. The following is my list of all the common punctuation that any one might use in a given essay, email, Facebook post (if you use punctuation at all online), stories, and so on. The punctuation that is read. There is a catch, however: you must have some sense of rhythm, of the flow spoken words follow; although you may be writing, every read word is spoken by the internal narrator of each reader, including you. So keep that in mind. EIGHTH REST = , COMMA — EM DASH – EN DASH: these allow the reader to catch their breath, without losing any momentum. The EM and EN DASHES function more as information asides rather than serious punctuation/rhythm markers, but still have some sense of resting. QUARTER REST = : COLON ; SEMI-COLON (PARENTHESES) [BRACKETS]: the colon and semi-colon find themselves between the comma and period in length of breath-stop, where there is a small amount of time given to these two punctuation marks to allow the reader time to consider the information that has preceded these marks before proceeding to the next half of the sentence. Parentheses and brackets, however, do not only affect sense of breath, but of volume too (which will have to be for another post), almost like softening of the voice, a whisper from the writer to the reader, a secret that may not be needed, but adds to the story; these both vary on the intent of the author, which should be visible through context of the sentence/paragraph/story. HALF REST = . PERIOD ? QUESTION MARK ! EXCLAMATION MARK: All end punctuation have the same value, a solid stop that indicates and end of information that is grouped into one grammatical unit of a sentence. WHOLE REST = WHITE SPACE between paragraphs, too, is a form of punctuation, of this sense of breath. Although some may argue that this white space is along the lines of a fermata, this small piece of white space is only intended to allow the reader time to process the information already provided, and prepare for a new set of information. It is a signal that the story/information is changing from the course that has been previously established. 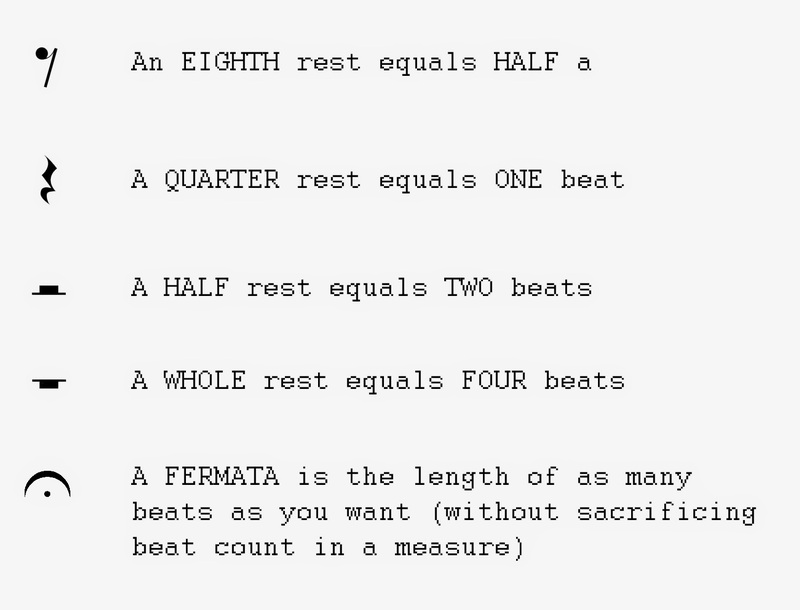 FERMATA = PAGE BREAK: Like the white space between paragraphs, the page break is an even greater pause, an indefinite pause, but for silence. Most often we find this break between chapters in many books. This space gives the reader the necessary infinite time to process the information that has been ingested, allowing sufficient time to prepare for the next chunk of information.
. . . ELLIPSES: Do not use unless you are removing information from an essay. There is no pause involved with the ellipsis, because it does not represent any type of spoken variations, it is only a means to visually tell the reader that something has been taken out of the information provided. I do not include hyphens, quotation marks, apostrophes, and asterisks because these are functions of grammar only, and do not suggest any change in rhythm, but exist to show the reader when information given is changing forms. This is punctuation to the creative writer. Punctuation is more than grammar, it is a means by which we attempt to represent how we slow and speed up time when we speak. Once you consider punctuation in this manner, it makes for a completely different writing experience, and often makes for more unique and intriguing pieces of writing. Plus, you don’t have to memorize all those arbitrary rules. I really love all the thoughts in this post! You are so smart. Really. You convey your thoughts very well. And music :) A language I can speak.